​About 20% of all people experience tinnitus (ringing in the ears), but only a fraction of those with tinnitus find it severely bothersome. With a variety of reasons that this phantom sound occurs, it can be difficult to know where to go for help or what to do about it. Join us for a discussion of how your ears and brain talk to each other, with a focus on how we currently can--and perhaps more importantly, cannot--measure the presence of tinnitus. Ring! Ring! will happen on Friday, Feb 8, at 7pm in the Mt. Vernon Homeslyce. Check out our Facebook event page while you're at it. 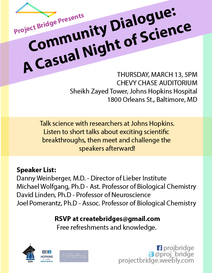 ​Join us for a charming evening of stories from Maryland’s science community! 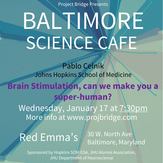 On Wednesday, February 13th at 7 pm, De Kleine Duivel will host the next Science Slam, brought to you by Project Bridge and BUGSS. 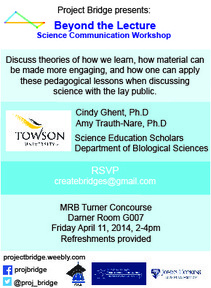 Come hear local scientists (grad students, post docs, citizen scientists, etc.) give short presentations about their research and compete for prizes. We’ve had all sorts of fun and diverse subjects at past slams, everything from machine learning to magic mushrooms to horseshoe crabs! The Science Gong Show is a science communication event where local scientists have a short amount of time to describe their work to an audience of non-scientists. Importantly the audience has cowbells which they can use whenever they hear any jargon. Come join us November 30 at 7:30 PM at Charm City Meadworks for some accessible science and delicious mead! 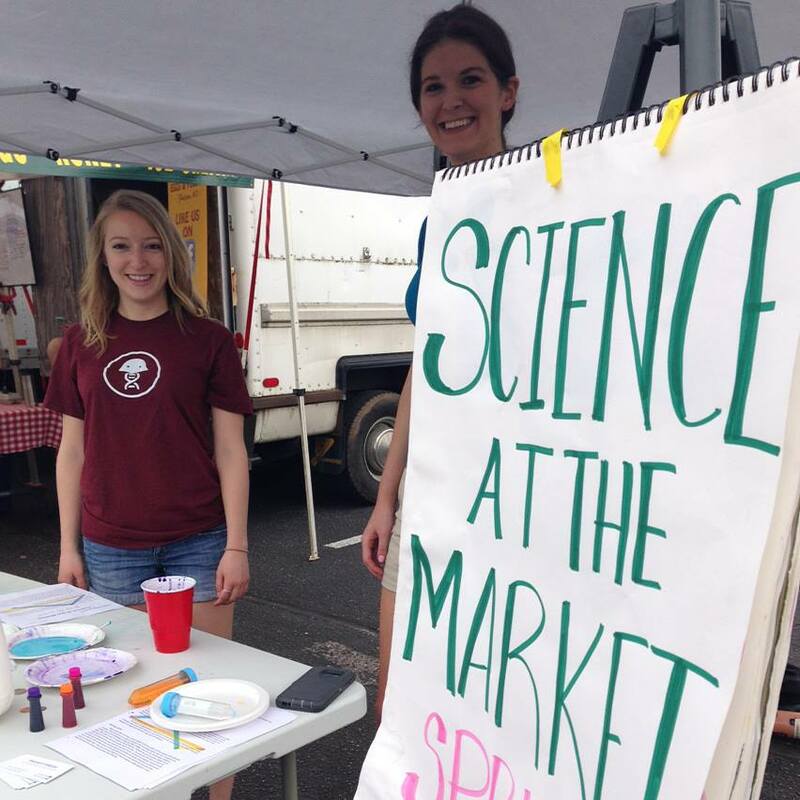 Science at the Market presents Climate on September 29! Join us for our last scheduled booth of the year anytime between 7:00AM and 12:00PM at the 32nd Street Farmer’s Market. Have you ever thought about the properties that make our climate special? We will do several fascinating experiments that show important relationships the gases in our atmosphere have between each other. 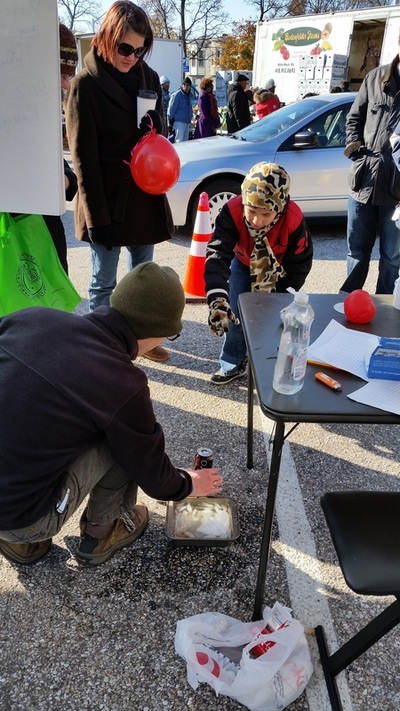 We will make clouds, play with pressure, and even have some fun demonstrations on temperature. Be sure not to miss this last chance to see us! 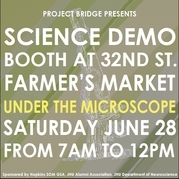 Science at the Market presents DNA on July 28! Have you ever wondered how your body knows to build itself? 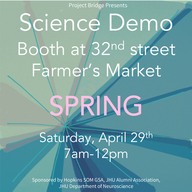 This Saturday, come visit us at the 32nd St Farmers Market anytime between 7:00AM and 12:00PM and we will explore exactly what DNA is. We’ll extract DNA from strawberries and host instructional demos on the structure of DNA and how it carries information. Join us at the market and learn just how fun and exciting the genetic code can be! 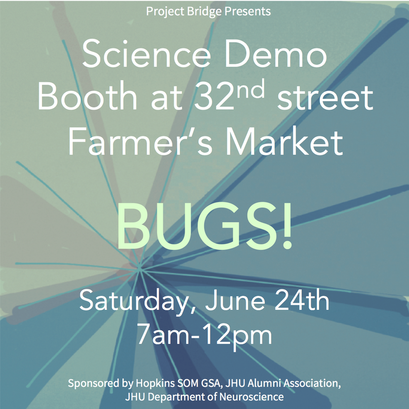 Science at the Market of Project Bridge presents Insects on April 28! 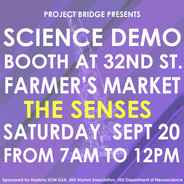 Come visit us at the farmers market on 32nd street anytime between 7:00AM and 12:00PM. Just in time for the spring season, we’ll talk about all the fascinating insects that are just coming out of hibernation. We’ll have cool demos on insect metamorphosis with live mealworms, and even cookies baked with cricket flour! We hope to show just how important insects are for us and our world. 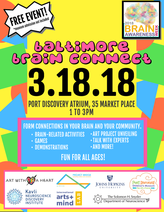 Come celebrate the end of Brain Awareness Week with the Baltimore Brain Connect! 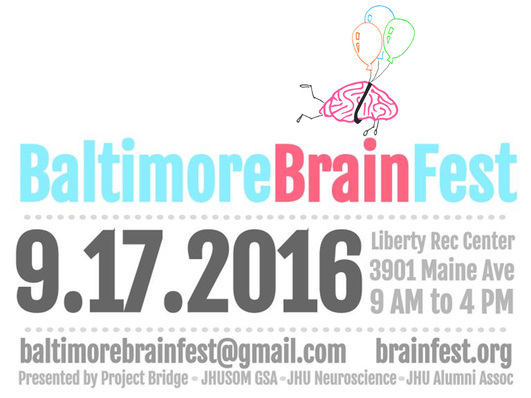 This event is FREE to the public and will consist of numerous hands-on brain science demonstrations, games, and more. Enjoy all of the art created by Baltimore students and connect with your local community! Brain Stimulation: Can We Make You a Superhuman? So come join us at Red Emma's on January 17th! 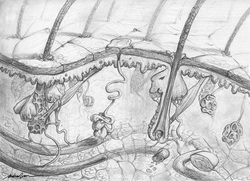 Light from the sun produced life on earth. Light plays major important functions that are important for our wellbeing including image-vision, adjusting our internal biological rhythms to match the solar day which influence our sleep and enhancing mood. We have made incredible advances in understanding how light achieves these functions. In this discussion, Dr. Hattar will provide exciting tidbits on how to use light to enhance your sleep and mood. So come join us at Red Emma's on December 12th! 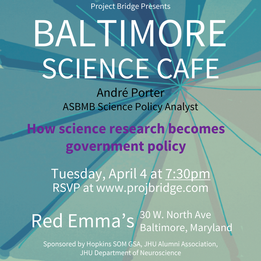 Join us for our 4th installment of an evening of intriguing and diverse science topics! This time at Red Emma's! 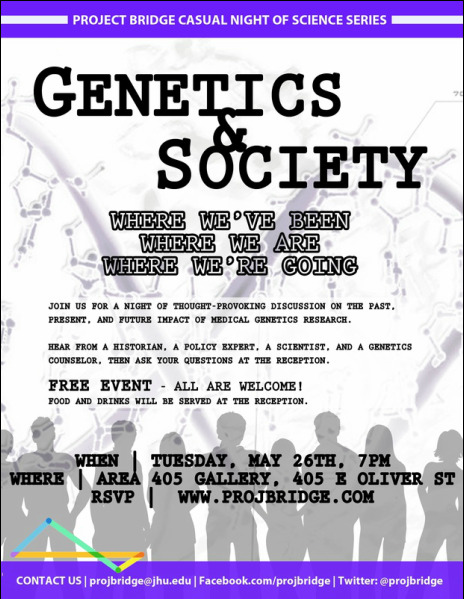 Project Bridge and BUGSS will host 6 local scientists (gradstudents, postdocs, citizen scientists, etc) to present their work/passion in 5 minutes. We give prizes to the talks that are most creative and best communicated! 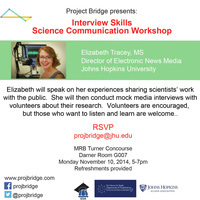 This is a great way to connect with others, learn diverse topics of science going on right here in Charm City, gain communication skills and experience, enhance chances of collaboration and emerging projects and ideas! And please contact slaun@bugssonline.org if you'd like a chance to present or know someone who might. Definitely check out our first Science Slam to see why this is an not-to-miss event. From the early decades of the 20th century, antibiotics transformed medicine, making mortality from bacterial infections a rarity in developed nations. However, we currently face a crisis of antibiotic resistance, with infection-causing bacterial pathogens increasingly acquiring or evolving the means to mediate infection in the presence of antibiotic therapy. In this Baltimore Science Café, we will discuss the past, present, and future of antibiotics, with particular emphasis on new strategies to treat bacterial infection. 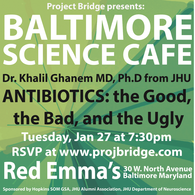 We will talk about what antibiotics are, how they act to cure bacterial infection, and how bacteria evade them. We will address important questions including: What caused the current crisis in antibiotic resistance? What are scientists doing to combat this problem? What kinds of therapies are on the horizon to avoid a return to a pre-antibiotic era of life-threatening bacterial diseases? RSVP through our Facebook event. 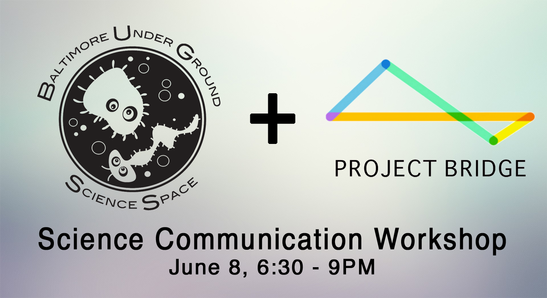 BUGSS and Project Bridge is hosting a Science Communication Workshop on June 8th from 6:30 – 9pm. We have speakers to guide and mentor on how to tell the best “story” of your research as well as break-out sessions to work on your own research story and get feedback from our group! Are you looking for a way to communicate your research? 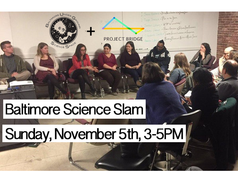 Have you heard of Science Slam hosted by BUGSS and Project Bridge? How about 3 minute thesis or other “big picture” talks that enhance communication of our research with a diverse audience? Feel the strong need to interact and connect important science ideas and research through communication to the public? BUGSS and Project Bridge are seeking grad students, post-docs, scientists, and citizen scientists that have a strong desire to engage the community! We are hosting a workshop to help support those interested in gaining confidence and skills to illuminate jargon, find the “hook” or “big picture” of their work and convey their passion and amazement of our scientific research! 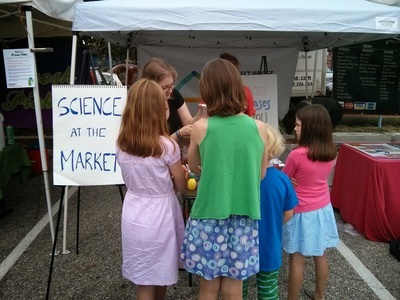 Science at the Market returns to the Waverly Farmer's Market this Saturday from 7am-12pm! 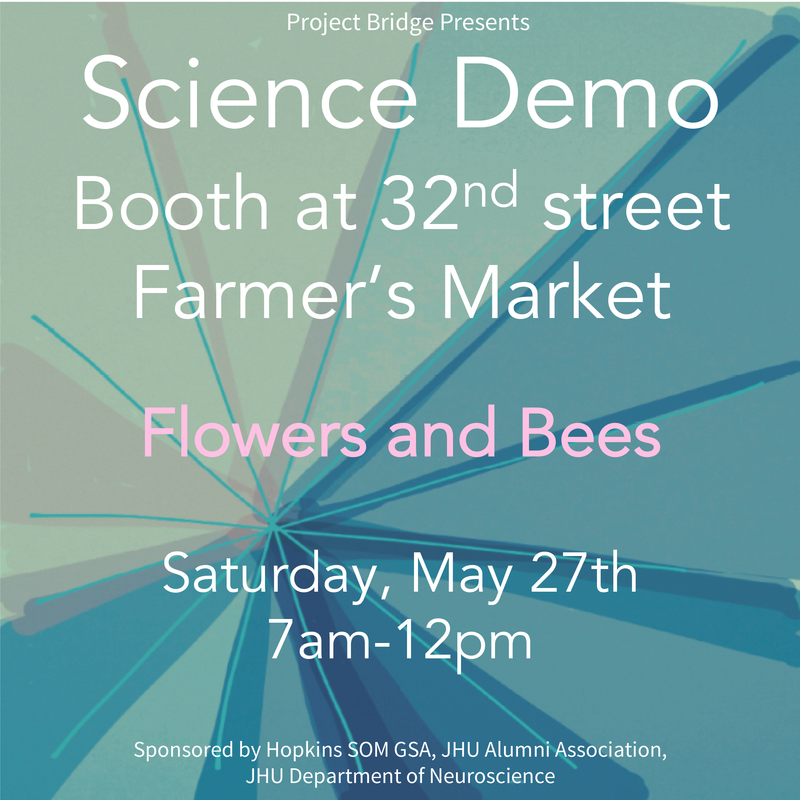 Market goers will be able to stop by and look at different specimen under our homemade microscopes as well as learn about bees and honeycombs with samples from the Hopkins beehive. Come join us! If you'd like to volunteer please contact me, Michelle Levine (levine.michelle.s@gmail.com). Spring has sprung! So let's do some science outside! Check out our booth at the Farmer's Market for fun, family-friendly, and interactive science demonstrations. Now more than ever the interface of science and politics has become a topic elevated to the forefront of political discourse. Partisan issues and uninformed decisions bring to light the role that opinions can have on the nation’s security and economy. Whether it be climate change or stem-cell research it is important to make sure that legislators and government officials put forward bills and policies that are driven by factual information. And check out the event on facebook! 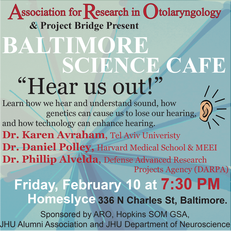 ​This special Science Cafe is in collaboration with Association for Research in Otolaryngology (ARO), an organization that promotes of research, both basic and clinical, in the broad field of Otolaryngology and related areas (http://www.aro.org/). ARO has invited three distinguished speakers in the area of auditory science to talk about their research. Dr. Avraham will talk about genomics and how her lab works to find changes in the DNA that lead to hearing loss (http://kbalab.com/). Dr. Polley will talk about how the brain processes sound and whether we can alter neural networks for therapeutic purposes (http://scholar.harvard.edu/polleylab/). Dr. Alvelda will speak about DARPA's Neural Engineering System Design (NESD) Program and related work to scale neural interfaces from lab demonstrations, to clinical prosthetics, and seed new industries that may eventually pave the way to extend human capabilities (http://www.darpa.mil/staff/dr-phillip-alvelda). 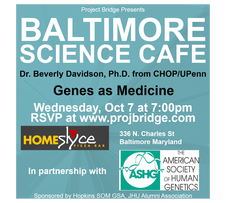 This Baltimore Science Cafe will be an evening conversation about CRISPR, the hot new genome editing technology on the block. It makes inserting, deleting or modifying genes cheap, quick, and simple. This has been an incredible boon to biomedical scientists, who can create animals and cells with targeted changes for both basic and therapeutic research. Clinicians are also looking at CRISPR technology for use in treating disease. 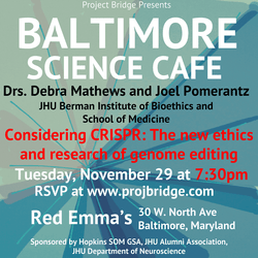 Dr. Joel Pomerantz, an immunology researcher, and Dr. Debra Mathews, a geneticist and bioethicist, will hold a panel conversation on the future of CRIPSR to discuss the many questions about the ethics and impact of genome editing. Mosquitoes rely on their exquisitely tuned sense of smell to hunt humans. But how does the mosquito nose know you are close by? 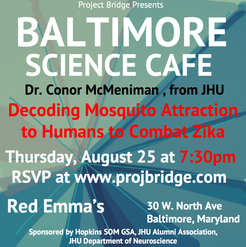 Dr Conor McMeniman, a neurobiologist at the Johns Hopkins Malaria Research Institute has spent much of his career trying to decode the molecular mechanics of the mosquito olfactory system, and the chemistry of human scent. He will present an overview of his smell research on the Zika mosquito Aedes aegypti, and how his research group is hacking the inner workings of the mosquito brain to combat Zika and other mosquito-borne diseases. 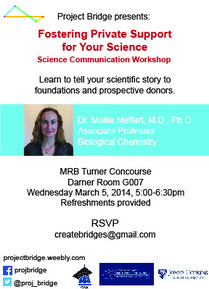 This special Science Cafe is in collaboration with Margaret McDonald's series called "Culture as Medium". 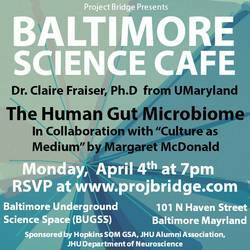 Dr. Fraser, told us about her work on the human gut microbiome. Her lab has studied the role of the microbiome in appendicitis, aging, and unique populations such as the old-order Amish. 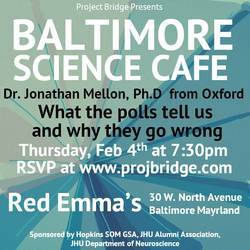 As primary season for the 2016 election gets underway, we had a crash course on the science of polling, and stories of Dr. Mellon's research into where polling and predictions go astray. 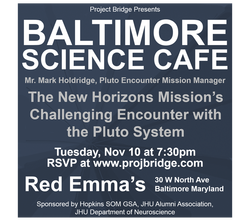 Featuring Mr. Mark Holdridge, Pluto Encounter Mission Manager for New Horizons. Mr. Holdridge led the overall planning for and the navigation to the July 2015 deep space flyby of Pluto by the New Horizons spacecraft built and operated by Johns Hopkins University Applied Physics Laboratory. He described the Pluto system and its potential for hazards. He discussed the key challenges of the mission and how the team overcame those, including navigation to Pluto, hazard avoidance, and unique mission operations challenges associated with operating a spacecraft 3 billion miles away. 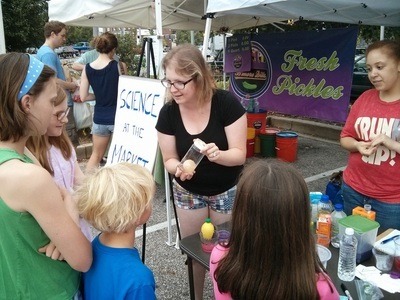 We had a booth with interactive and spooky science activities for the whole family! This month's theme was transitions, and we separated out colors from leaves AND had some spooky dry ice. 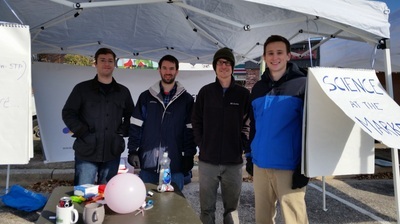 This was our last Farmer's Market booth for the season, so stay tuned for new booths in the spring! This month featured Dr. Beverly Davidson from CHOP/UPenn. Dr. Davidson discussed current techniques being developed for treating inherited diseases using gene therapy and gene silencing approaches. She provided an overview of the state of the art in the field of molecular medicine, challenges that face the field, and interactive dialogue. Guests enjoyed beer, some pizza, and science! This month featured Dr. Jonathan Pevsner, Ph.D., Professor of Neurology at the Kennedy Krieger Institute and Professor of Psychiatry and Behavioral Sciences at Johns Hopkins Medicine. Dr. Pevsner’s laboratory studies the genetic basis of childhood brain disorders and specializes in sequencing and interpreting the genomes of patients. He discussed the beauty and mysteries of the human genome, including their recent discoveries of the cause of a rare disease (Sturge-Weber syndrome) as well as commonly occurring birthmarks. 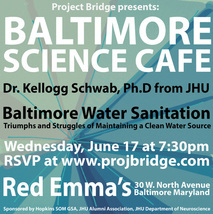 This cafe featured Dr. Kellogg Schwab, Ph.D, Director of the Johns Hopkins University Water Institute, who talked about water in Baltimore. Clean water is a precious and finite resource. Baltimore has plentiful source water supplies but an aging piping system that presents challenges to providing high quality water all of the time. Emerging contaminants entering our drinking water system are also of concern. Dr. Schwab has traveled around the world conducting research on developing sustainable, scalable solutions to water and sanitation challenges. His talk will focus on water and sanitation (i.e. the joy of indoor plumbing) and what is happening in many low income countries with a focus on women empowerment, entrepreneurship and innovative solutions for the water and sanitation crisis. 2nd Annual Casual Night of Science! May 26, 2015. 7pm at Area 405. Multiple Sclerosis (MS) is a debilitating, degenerative disease of the nervous system that affects young people in the prime of their lives. Significant disability can occur, causing difficulty for patients, caregivers and society. The United States is a leader in MS research and patient advocacy. Patient driven initiatives in the United States serve as examples to other countries worldwide and can help promote change and better patient care both at home and abroad. 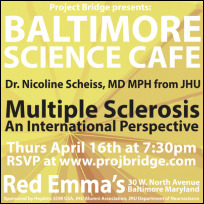 Dr. Schiess shared her experiences treating MS both at the Johns Hopkins MS Center as well as abroad. How Does Breast Cancer Metastasis Really Work? 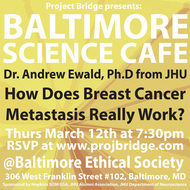 Dr. Andrew Ewald is a breast cancer researcher in the School of Medicine at Johns Hopkins University. The majority of breast cancer mortality occurs when the cancer acquires the ability to spread to other organs, a process termed metastasis. His lab focuses on understanding how breast cancer cells acquire the ability to metastasize and on developing strategies to stop them. He discussed his lab’s recent research in the context of the broader cancer research effort. What do economists mean when they talk about rationality? Given often highly partisan rhetoric, what rationality means to an academic economist is often not what it means to anyone else. 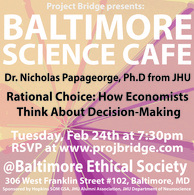 This talk was an introduction to how (and why) economists view human decisions through the prism of “rational choice”. Through an illustrative example (the anti-vaxx movement), we also discussed what “rational choice” does (and does not) imply. This month featured Dr. Khalil Ghanem, M.D, Ph.D. Associate Professor of Infectious Diseases in the Division of Medicine at the Johns Hopkins University School of Medicine discussing “Antibiotics: The Good, the Bad, and the Ugly”. Dr. Ghanem discussed how antibiotics can be used for good, but also how they can be badly misused and the ugly results that follow. Will a Malaria Vaccine be Enough? 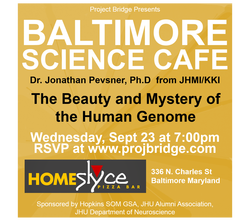 This month our café was at the Baltimore Ethical Society and featured Dr. Jürgen Bosch, Assistant Professor of Biochemistry and Molecular Biology at the Johns Hopkins School of Public Health. Dr. Bosch discussed malaria’s effects on world health, current research to develop new malaria treatments, and efforts to develop a vaccine for this disease. 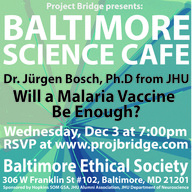 Dr. Bosch focused on vaccine development and asked the question, will a vaccine ever be enough to control malaria, a disease that affects millions of people worldwide? 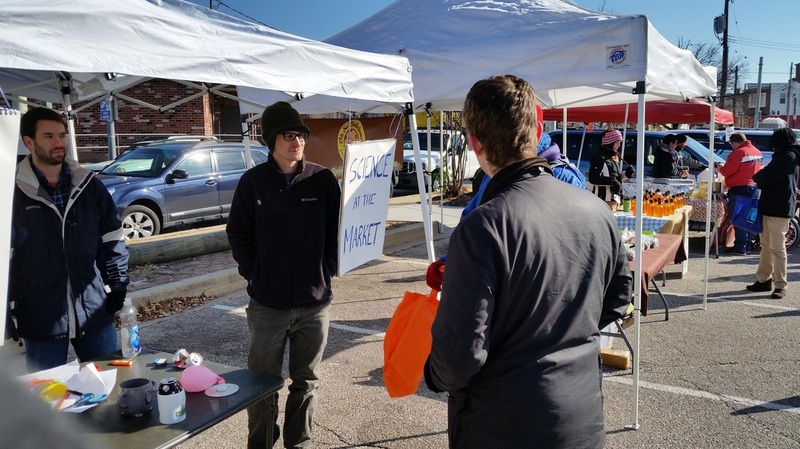 Project Bridge hosted a booth at the farmer's market, with demonstrations of different scientific themes and volunteers who can answer questions and discuss ideas within that theme. Ms. Tracey talked about her experiences interviewing scientists and sharing their work with the public, then gave mock interviews to student and postdoctoral volunteers about their research. This was a great opportunity to practice explaining what you do to a lay audience and to get constructive feedback, just in time for the holidays! 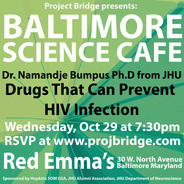 Dr. Bumpus discussed the history of HIV and another use for currently approved HIV drugs; namely, the prescription of these medicines to people who are not sick to prevent them from becoming infected. 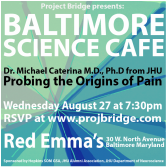 This cafe featured Dr. Michael Caterina from Johns Hopkins University. He discussed the origins of pain. 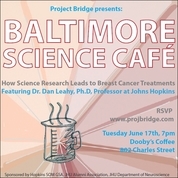 This month's Science Cafe featured Dr. Gul Dolen from Johns Hopkins University. She told the sometimes controversial and complex story of autism. 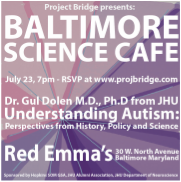 Guests joined us for a discussion about autism from the perspective of history, policy, and science. Each month will feature a science expert focusing on a human disease. The speaker will discuss the history, current research and treatments, and the future of that field of research. The event is free and open to everyone! Questions, comments, and dialogue are encouraged during the discussion. Guests joined us for the story of how a popular breast cancer drug Herceptin works, how it was developed, and the future of breast cancer treatments. We discussed theories of how we learn, how material can be made more engaging, and how one can apply these pedagogical lessons when discussing science with the lay public. Guests joined us for an exciting night of fascinating talks from prominent researchers from Johns Hopkins! They presented short stories of modern scientific breakthroughs and how they have affected society. An informal happy hour after the talk allowed for dialogue to continue. Joel Pomerantz, Ph.D. - How do Scientists Discover Important Stuff? Danny Weinberger, M.D. - How do Genes cause Mental Illness? Dr. Meffert shared her own experiences in fostering support for her science, and discussed tips and strategies to do so yourself! 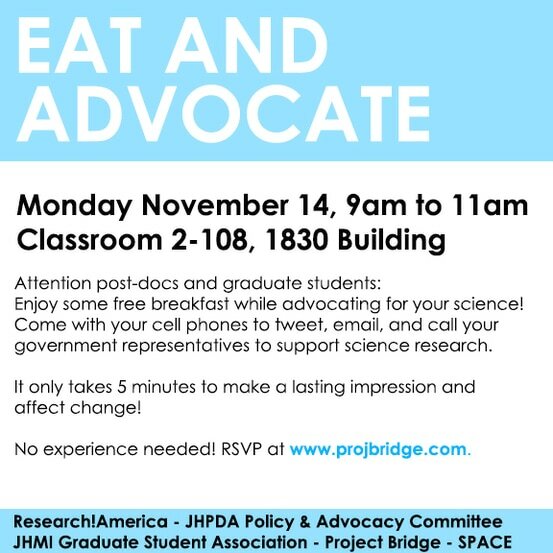 Want to practice your elevator talk, present your science research, or listen in on these practice presentations? You could have joined us at WBSB 811, where any interested scientist was able to present a science talk aimed to a general audience. Snacks were provided! Call for Science-inspired artists and art! Interested in the intersection of Art and Science? 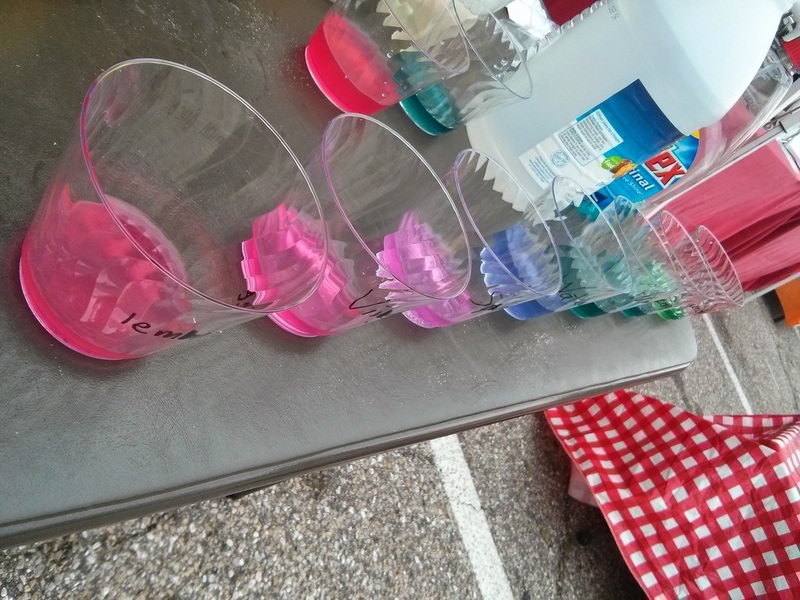 Want to display your science-inspired artwork to a diverse audience? We are looking for exactly that! What we were looking for: the artwork must be inspired by any type of scientific phenomenon. It can range from abstract sculptures of DNA to detailed and effective infographs. You can still email us if you are interested. 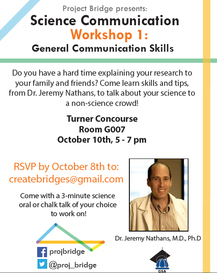 Scientists developed their communication skills in this first ever Project Bridge workshop with Dr. Jeremy Nathans!